Today I am going to help you in verifying your HostGator hosting Account. Few days back I have buy a hosting account from HostGator and my account got active instant but after two days when I was trying to login to my HostGator account I couldn’t able to. I was gating an error Login Attempt Failed! So I got worried a lot, I have tried to login at least five times wondering maybe I am typing my password wrong. In order for us to setup your account, we will need you to call in and verify your billing information. If you are unable to call us, you can instead respond to this ticket with a scanned copy of a Photo ID such as a passport, or drivers license. In addition to a photo ID, please include a scanned copy of the credit card that was used in your account purchase (assuming you purchased a hosting account with a credit card). For security purposes you can mask off all the digits of the card number except for the last 4 digits. We are available 24/7, so please feel free to call us at your convenience. We apologize for any inconveniences that may result from this process. Now I was wondering that if I called them it will going to cost me Rs.9/min (approx) and don’t know how much time will they take to verify. So I show what the other option I have to verify. Other option was to give the scan copy of my ID proof (issued by Govt.) and Credit card. And I don’t have my Credit Card I have used someone else card but due to some personal reason even I couldn’t able to send the scan copy of Credit card. Next day in my mind came I can try using Skype as they have option to call all over the world might I can try there Toll-free and if it worked it wont cost me anything. Hope now you got how you can also save your money in verifying your HostGator account. 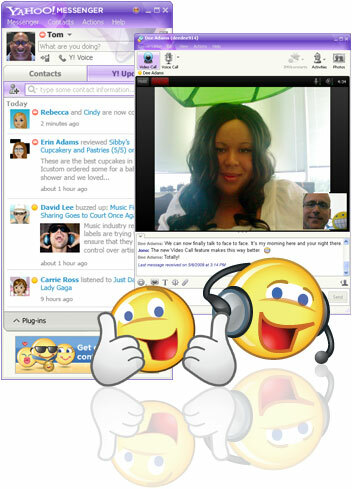 Posted on November 29, 2010 May 17, 2012 Categories AllTags All, Application, HostGator, Hosting, How To?, Internet, Live Chat, Personal, Safety, Skype, Tips & Tricks, Tutorials, Verify, Web Hosting1 Comment on How To Verify Your HostGator Account Using Skype? Today in this post I will tell you about Google AdSense Allowed Sites option. I was thinking about AdSense Allowed Sites option from many days, will it help me in my AdSense earning or not, and if it will help, then how? So I got some points on how it will help and how it will not. v When someone copy your AdSense ads code (copying anyone’s AdSense ads code is very easy) and paste in on their site, sites which can violations AdSense policies which can bring your AdSense account in danger and also your account can get block forever. v If you have a competitor or enemy who wants that you to use AdSense they can massively click on your AdSense ads and get your account banned. v Like if you are a developer and you are creating a WordPress theme, for testing purpose you have placed your AdSense ads code on that theme and later on you have forgotten to remove your AdSense ads code and you have uploaded it and made that theme available to for public use. Now people who will download your theme will use it on their localhost or online with your AdSense ads code. And if that person is doing modification in that and your ads are keeping getting refresh again and again. As in this how you will lose is when you will add your sites in Allowed Sites option and when visitors will visit your site using in the given above way Google will display ads but any earnings will not be shared with you. Will you turn it on? As personally I am not using it. Posted on November 27, 2010 May 17, 2012 Categories AllTags Advertisements, All, Google AdSense, Google Inc., Income, Internet, Safe, Safety, Tips & TricksLeave a comment on Should You Turn On Google AdSense Allowed Sites Option? Today in this post I will tell you how to download your Facebook Data on your computer. Facebook recently added a new feature by which we can download our Facebook data in a zip file, in that zip file you will find your Profile Info, all your Wall posts, all your Photos which you have uploaded, all Videos that you have uploaded, name list of your Friends, Events which you have attended and private Messages you send/receive to/from your friends. Finally my project is completed and gone good, now just waiting for an online exam which can be held within two weeks and thanks to all of you for your wishes and your patience for my irregular update on my blog. Anyways, today in this post I will tell you about Yahoo! Messenger 11 BETA. Yahoo! have came up with a new messenger, with lots for great new features that can help you in staying connected with your favorite Social Network. 1. Play Social games: – Now you can play many social games from Zynga, OMGPOP and ELEX. 2. Keep Yourself Updated: – Now you can get access to your Yahoo! Pulse, Facebook, Twitter and many more. To download Yahoo! Messenger 11 BETA Click here. 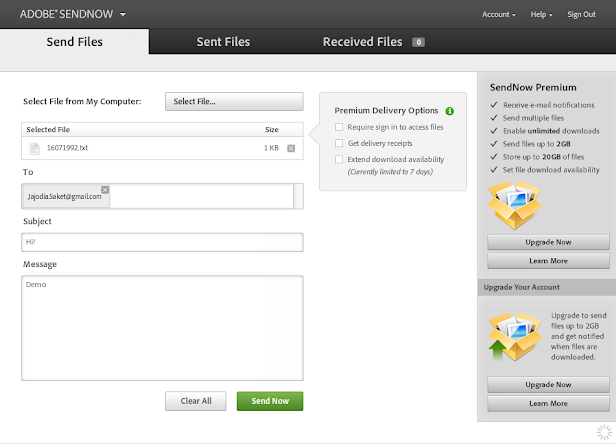 Today in this post I will tell you how you can share files using Adobe SendNow. Adobe have started a new online service called SendNow, which let you send file to anyone you want. For free account Adobe SendNow lets you send file up to 100 MB and the file will automatically get deleted after seven days or you can delete it manually whenever you want (before seven days from the time you have uploaded). Total you can keep up to 500 MB. you won’t be able to send more than one file at a time. To use this service you need to sign-in if you have an account in Adobe.com or you can sign-up for free. For Premium account Adobe SendNow charge $9.99 in that you can send up to 2 GB file for windows user and 1 GB file for Mac user and your file will never get deleted automatically till you don’t delete it or you can set the time limit. Send more than one file at a time. All the file you will send, you will get conformation that your file is sent. And even you can track when you file is been getting downloaded. However still there is limitation is sending file like Music, Video, Fonts, .exe, WinRAR and etc. Currently you can only send files like PDF, Zip, Office files and etc.